Fine dining is available in Hochatown at Abendigo’s Grill and Patio while good family style cooking can be had at Stevens Gap Restaurant (we recommend the catfish). Also you can enjoy Pizza and over 14 varieties of tap beer at The Grateful Head or try The Blue Rooster for fish and chicken and home grown vegetables. You can play hard at the area’s available activities or just relax. We strive to make your stay enjoyable with pleasant memories and our desire is that when you reflect, you’ll say “I’ll be back”. 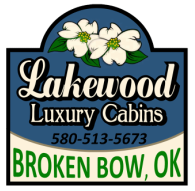 Plus, if you thoroughly check, we believe our nightly charges are a little less than other similarly outfitted cabins in the area.